Beautiful rare orchid found in the forest! 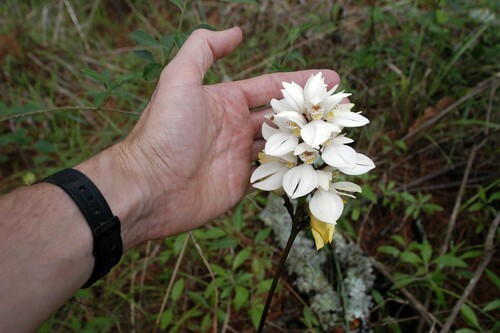 We have found a very interesting rare orchid growing in the forest. 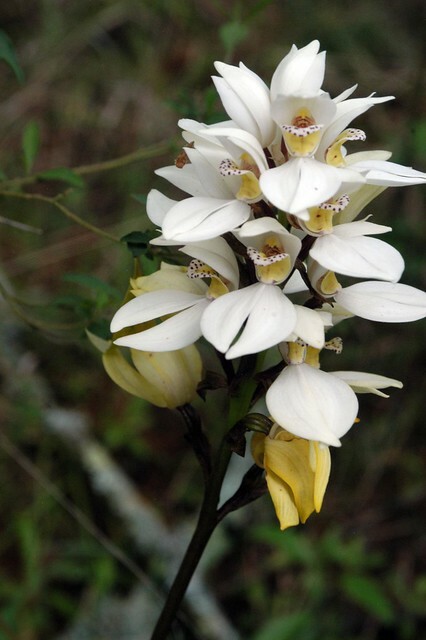 Govenia utriculata, also known as, Govenia Capitata, a member of Orchidacae. It was first spotted June 12th, 2009. If you visit in July, seek out this flower! But don’t pick it, or any other flower you find! If you pick a flower then it will not reproduce. Don’t kill the plant off simply because you think it is pretty! These delicate plants do not like to be disturbed. It is mostly pollinated by bumble bees. What insect pollinize Govenia utriculata? Many orchids are very specific about how the flower can be polinized, If we knew what insect pollinizes it, then we could take a litle extra care to make sure that habitit for that insect exists nearby. The scientific texts suggest that bumblebees to the job, and we do have some bumble bees here, but perhaps there are others too. Fortunately, we don’t even have to figure out who the pollinizers are. As the forest heals, many native plants and insects will gather making the biosystem increasingly diverse. Still, it would be a nice task to sit near the flower for a few hours in hopes of finding out what insects pollinate it. How can the orchid be propagated? Protect it! We don’t know yet how to reproduce it. The first thing to do is to protect it by not disturbing it. Change nothing nearby. When it blooms it can produce millions of tiny seeds, but still it will be rare for a seeds to land in just the right spot to germinate. We can help the plant out by making sure the seeds have a chance. Our best option is to simply spread the spores as widely as possible where there are living oak roots. Govenia utriculata lives in relation with fungus. At the Fusion plant propogation center. The goal is to learn to produce those trees and plants which are easiest to propagate and which can serve people. We will place the orchid on the oak substrates used for outdoor mushroom growing. Especially on oaks being used to propagate native fungus. These two plants are similar so we will try to get them as well: G. purpusii, G. tequilana, or more likely, when we see them we will GPS their locations and try to help them reproduce where they are at. More information in the Bosque Village wiki. It is a delight to find a new rare plant in the forest! Get Bosque news in your inbox!